The Civic Federation has long encouraged government transparency and accountability, both of which are emphasized in our Mission Statement. To promote financial transparency many local governments provide a Comprehensive Annual Financial Report (CAFR) for each fiscal year. Not to be confused with a government’s budget, which is principally a roadmap for the upcoming fiscal year and largely relies on cash basis accounting and forecasting, the CAFR details the government’s audited actual, year-end fiscal activities and includes revenue collection, expenditures, debt service and fund balance reserves. However, as recently highlighted in a blog on the Governing magazine website, CAFRs can be very dense and complicated. The authors point out that very few governments produce a simplified financial statement despite its obvious benefit to citizens. But, they recognize that New York City, which has an annual budget of $78.5 billion, recently released its first popular annual financial report (PAFR) for its 2015 fiscal year ended June 30, 2015. The inspiration for this post was to examine which local and state governments in Illinois and around the U.S. produce a PAFR. What is a Popular Annual Financial Report? Many governments in the U.S. are required to produce audited financial statements. Many also produce the more detailed CAFR document. These documents can be complex and difficult for a layperson to understand. Therefore, good government groups like the Government Finance Officers Association (GFOA) encourage governments to also produce a simplified summary called the PAFR that the average citizen can read and understand. A PAFR is not a required document but is considered by the GFOA to be a best practice. According to the GFOA, to increase transparency and accountability, the PAFR should contain clear language, not the jargon and technical language often found in budget books and CAFRs. The PAFR should also be inviting to the reader, which can be accomplished by creating an open layout and easy-to-understand charts and graphs. The PAFR should report the actual fiscal condition of the municipality, government entity or state. Some form of appropriate narrative or graphic analysis must be provided to explain items of potentially significant interest or concern. What Governments Provide a Popular Annual Financial Report? The GFOA recommends that governments provide a PAFR to increase accountability and transparency, but only around 140 total U.S. local and state governments have won awards in the most recent GFOA PAFR awards program. In the following, we look at local governments for which the Civic Federation provides budget analyses, local governments and governmental entities in Illinois and a comparison of the top ten largest U.S. Cities to see whether they provide a PAFR or PAFR equivalent. The following table exhibits the local governments that provide a PAFR. As indicated in the table, the Chicago Park District is the only local government that regularly provides a PAFR to its stakeholders. The City of Chicago released a PAFR in previous years, but it has not released a PAFR for its most recent 2014 fiscal year. Chicago Public Schools also previously released a PAFR, but it has not done so since FY2010. The remaining five local governments do not make a PAFR available to their constituencies. 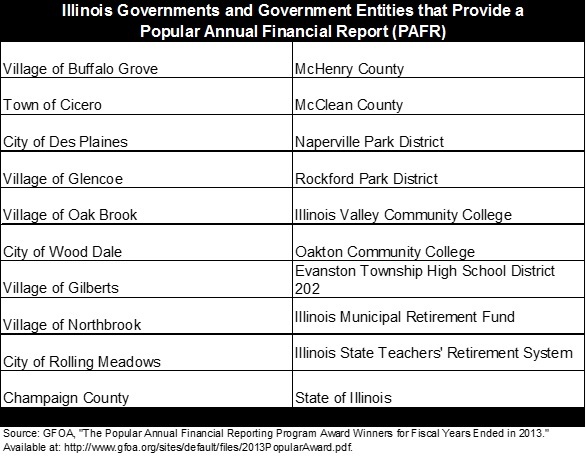 There are a few regional and downstate governments that provide a PAFR to stakeholders, but of the 6,968 local governments in Illinois only the following 17 governments received awards in the GFOA’s award program, meaning that other governments might provide a PAFR or equivalent but those documents may not be submitted to the GFOA’s PAFR awards program. Two public employee retirement systems in Illinois, the Illinois Municipal Retirement Fund and the Illinois State Teachers’ Retirement System, also provide a PAFR to their stakeholders. It should be noted that the State of Illinois is one of only four states that won the most recent GFOA popular annual financial reporting award. Finally, New York City, the largest city in the U.S. both by population and by its operating budget of $78.5 billion, recently provided its first PAFR to the public and summarized the 422 page CAFR in 24 pages. 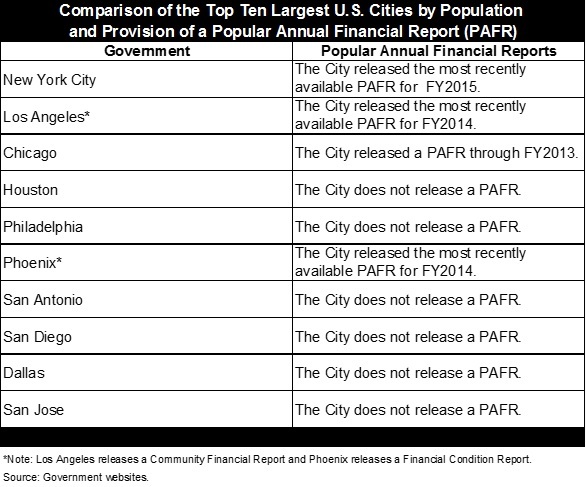 Both Los Angeles and Phoenix provided PAFR-equivalents for their most recently available audited financial information. Note: Local government financial reporting varies by state. Illinois requires all local governments in the State to submit an Annual Financial Report (AFR) that summarizes revenues, expenditures, fund balance and debt, but does not require them to submit a CAFR which often provides more in-depth financial information. New York’s annual operating budget is 25 times larger than the City of Chicago’s annual Corporate Fund budget of about $3.6 billion.